It’s Saturday morning – well morningish – and we were paying the small price for going out the night before to welcome our new roommate to the house. BD and I were up and trying to decide on what to make for breakfast when our new roommate, HD, strolled into the kitchen and asked what was for breakfast. I think this is where he got a quick crash course in what cooking and eating is like for us on most days. (HD is BD’s brother so he did have some idea having been over for dinner or get-togethers.) 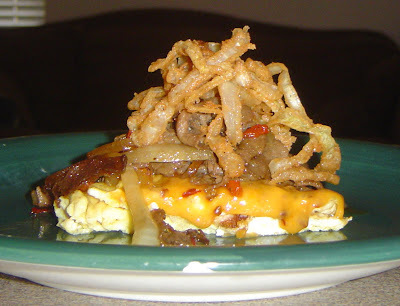 I smiled at him and relayed what BD and I had just decided on making: Omelet with shaved steak, sautéed peppers and onions, chipotle cheddar cheese, and crispy fried onions on top. His face was pretty priceless. BD was kind enough to make breakfast for us while I padded around the house. After what seemed like forever breakfast was finally done, and it was the perfect remedy for what ailed us. While the dish was pretty delicious, my only complaint was that there could have been more cheese!